If you think this is messy, you should have seen it a couple hours ago! You have 23 paintings to pack. Numerous wooden crates. One goal. 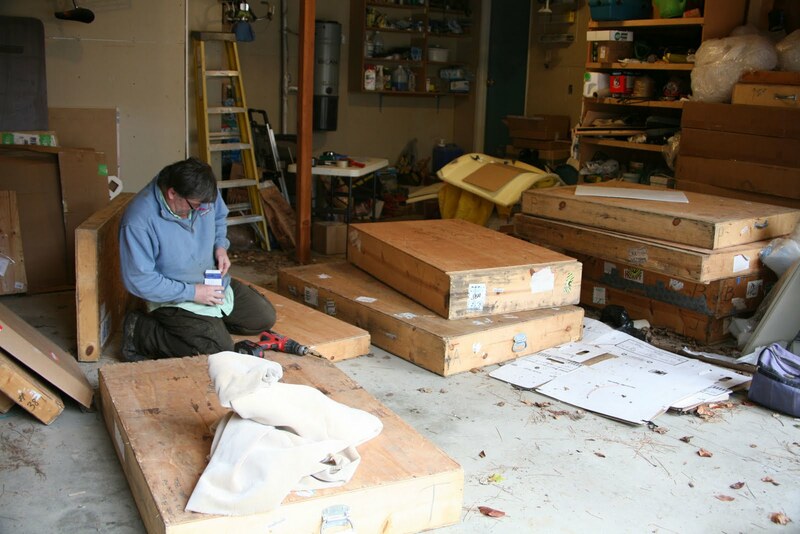 Pack all the paintings in the fewest number of crates, but with 150 pounds as the maximum weight per crate and maximum crate dimensions of 165 inches (length + girth.) With which box do you start? I opted for Box D. Fortunately, this was a good choice. Not only did I get in my largest painting, but the second layer worked really well for 5 more paintings and one framed print. The remainder of the paintings fit in Box Y and Box O. Barely. One box ended up at 141 pounds (about 41 pounds heavier than I would have liked), but the box was in really good shape and everything fit well with no wasted space. Of course, trial and error in painting placement is in full force as one painting then another is tried in various open spaces. Or maybe I try two smaller ones? Or rotate that one over there? This process takes me hours. I take care in packing the paintings, making sure there is no wobble from side to side if a painting is not on the bottom layer. And the reason for this effort? The upcoming Waterfowl Festival in Easton Maryland. The VIP event kicks off on Thursday evening November 11th. On Friday, Saturday, and Sunday, the show will be open to the general public. This year, all the painters will be under one roof at the Tidewater Inn. A great chance to see your favorite oil, acrylic, watercolor, graphite, scratchboard, and wood burning artists in one location! As for me, the packing is done. Time for a beer! Often I let the subject matter dictate the style I will use in a painting. 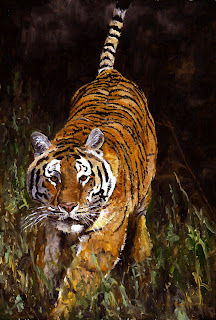 In my mind, a tightly rendered tiger would have slowed the action I was trying to portray. Besides, it was fun working with loose brush strokes! Though I recently completed Eyes of the Forest with six Eye See Yous in one painting, it has been a while since I have painted a single Eye See You. 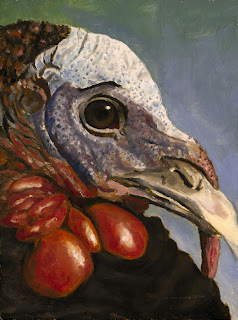 For my upcoming show, the Waterfowl Festival in Easton Maryland, I painted a turkey, a wood duck, and a pheasant in the Eye See You format. Notice how the subject attempts to blend into the background. This creature often uses camouflage or an object (such as a large bolder) to mask its presence. It also carries around a large white and black appendage or a book with lots of papers and a writing utensil. We think it may do this because it is trying to learn to use its opposable thumbs. With careful observation, we have found that the subject will "creep" to new locations. An act of quietly and slowly moving to gain a better vantage point. An entire treatise could be written on the sometimes bizarre behavior of this creature, but to sum up, its methods seem to produce some great reference photos. 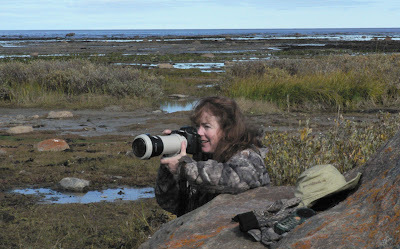 Yes, this is me in the Manitoba tundra getting some great shots of migrating snow geese. Many of the little ones (this year's young) have never seen a human! In the background, you can see Hudson Bay. This tundra landscape changes dramatically twice a day with its fourteen foot tidal change. Here, the tide is moving out. This was a great trip to Northern Manitoba. We were at Dymond Lake (about 30 km west of Churchill) with Webber's Lodges. It was not uncommon to see my footprints of yesterday afternoon covered by polar bear tracks, or wolf, or arctic fox. 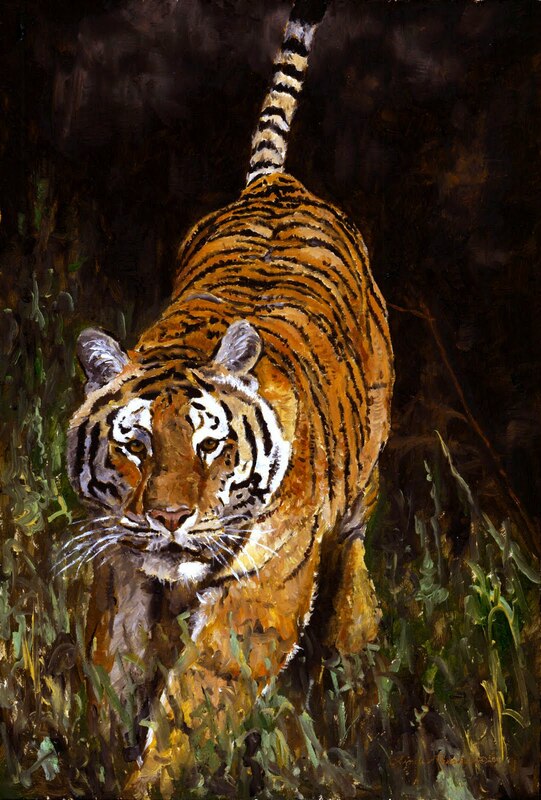 In the near future, you can expect to see some paintings from this amazing trip.